​Personally, I find hands one of the most difficult parts of a human figure to draw correctly. That is why I usually draw them very simplified when doing quick runway sketches but it is also important to learn to draw them properly for other purposes. In order to be able to sketch all the aspects of hand movement, joints, proportions and angles, it is necessary to invest lots of hours of practice. ​Well drawn hand can make the figure look more graceful and feminine and if you have a sketch with a badly drawn hand it can ruin the harmony of the entire drawing. ​In terms of proportions, the hand is the same length as the face. Each finger has a different length. The various joints and movements of the hand make it a valuable element for communicating the persons character. ​If you take a good look at your own hand, you will notice that your palm looks like a square if you simplify. As you move your hand, the rectangle will move and look a bit different from different angles. ​Between the palm an the thumb you can image a triangular shape. 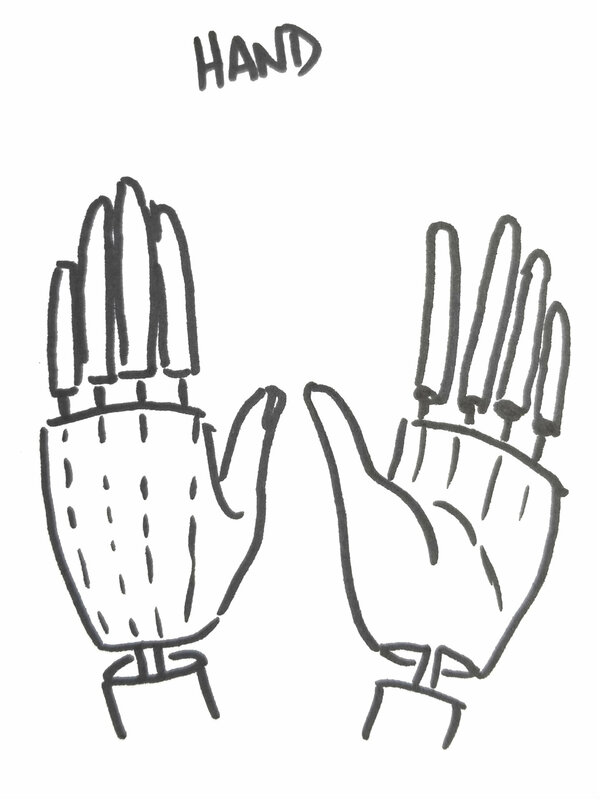 ​Fingers have cylinder shape and are divided into three parts, except for the thumb that consists of only two sections. Depending on the position of the hands some cylinders will overlap and cover others. ​When you have your main shapes on the paper and correct proportions, then you are ready to add contour lines. With practice it becomes easy to draw the outline quickly and effortlessly. ​This part is the most fun part for me. When you are practicing you can use your drawing pencil to add shadow and make the hand look 3D. Depending on the position of the hand, you will have 3 types of shadow. The highlighted parts that are the closest to the light source, then some drop shadows in the areas where the hand is far away from the light source.And lastly the darkest shadow in the deepest corners and points away from the light or in the shade of some other objects, such as clothes or jewelry. ​Most common hand position when it comes to holding bags is holding the handle and this is the one I also use the most. 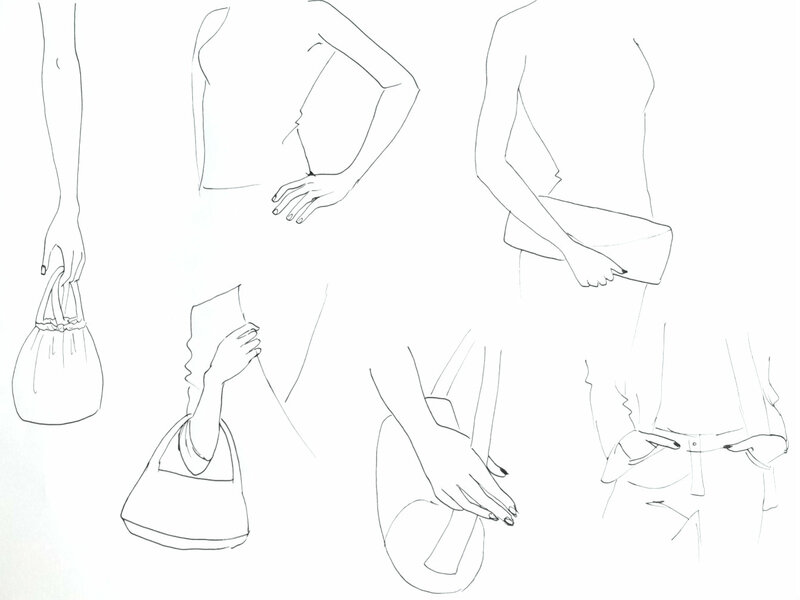 It is also nice to know how to draw a hand holding a clutch bag or holding the cross body bag in a casual way. ​In fashion illustration it is very common to draw a fashion figure with hands in pockets. Although it sounds like an easy task it is actually quite difficult to draw correct proportions and not make arms look awkward. ​Most outfits look more fashionable when accessorized and you will often have to illustrate bracelets or rings on hands with a specific outfit. In this case, I find shadowing to be trickier than sketching. You have to pay attention to all the drop shadows made by jewelry to make a realistic sketch that will complement the entire drawing.